If you know any good Edgar Allan Poe sites that I've missed or if you have a site and you would like to exchange links with me, please let me know. Please note that I will only link to sites that relate to Poe or education. I will not link to your site if it contains any obscenity or profanity. An extensive collection of Poe's works. Under each story, the various dates of publication are listed, and at least one link to the text. This is a fairly complete collection although I've noticed some errors, probably due to whatever OCR software was used to scan the text. This is a modern commercial site with popups and ads. It is not a complete collection but it contains most of Poe's stories. Unfortunately, "Ligeia" and a few others are missing. 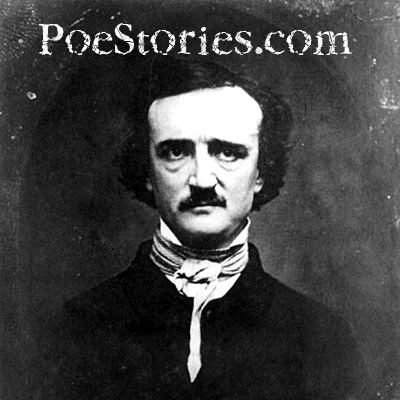 Another site with a fairly complete set of Poe's stories and poetry. It suffers from the same occasional OCR errors as the EServer site. Example: In "Ligeia", second paragraph, third word from the end is "eves" instead of "eyes". This error also exists in the EServer version. I think this is a mirror of one of the previous links. Even so, its always good to have multiple sources. Baltimore, Maryland is celebrating the life and works of Edgar Allan Poe with a yearlong citywide festival�Nevermore 2009. The festival will officially kick off in January 2009 with a variety of events to celebrate Edgar Allan Poe's birthday, followed by a year of lectures, wine tastings, art exhibitions, special tours and more all in honor of Edgar Allan Poe. Plenty of interesting content and discussion of Poe's works. Read excellent essays by Christoffer Nilsson, Martha Womack, David Grantz, and others. "The growing collection of essays in the Poe Decoder is written by qualified people with a great interest in Edgar Allan Poe. We want to provide you with accurate facts on one of the greatest American writers ever, and once and for all put an end to all the lies and rumors that surround his person." An ecclectic collection of all things Poe. Links to just about anything that has to do with Poe can be found in the "Virtual Library". The site is current as of December, 2007. I found some interesting links on this site that were hard to find in Google. A well designed site, with educational resources and listings of local events related to Poe. A site maintained by the National Park Service. A good list of links to many Poe resources. Updated each year. Established in 1972, provides a forum for the scholarly and informal exchange of information on Edgar Allan Poe, his life, and works. Wikipedia is a great resource to look up just about anything, including Edgar Allan Poe. Our Twitter page. Follow us and get random Poe quotes and web site updates! Various New York Times articles about Poe, Poe fans, and books written about Poe. Watch actor Vincent Price perform "The Tell Tale Heart" on YouTube. Part 1 of 2. Watch Vincent Price perform "The Cask of Amontillado" on YouTube. Part 1 of 2. The second half of the performance by Vincent Price. Vincent Price reads "The Raven"
Watch Vincent Price's performance on YouTube. An excellent reading of "The Raven" by actor, Christopher Walken. An interesting page detailing the solution to a cryptogram believed to have been written by Poe. It was finally solved in October of 2000. The Baltimore-Washington Beer Works, of Baltimore, Maryland. A list of almost 400 fans of Edgar Allan Poe from around the world. Free to join. "Midnights so dreary, tired and weary. An ominous vibrating sound disturbing my chamber's antedoor..."
A humorous, albeit somewhat geeky version of Poe's "The Raven", themed towards using the internet and newsgroups. O'er many a strange and eerie page with flash and gifs galore..."
Interesting pages about Poe and alcohol. Free, multi-language, online encyclopedia. No advertising. One of several pages I used to look up nautical terminology used by Poe. Another good reference page for nautical terms. Comprehensive site for learning about writing. The 1913 edition of Webster's Dictionary and Roget's Thesaurus. No advertising, no popups, etc. Free English Dictionary with multi-lingual search, specialized dictionaries, crossword solver, and creative writing resources. This is a commercial site with lots of ads but there are some great quizzes to test your knowledge or Poe and his stories. Site dedicated to old movies, including several adaptations of Poe's works starring Vincent Price. Free Bookmark Manager lets you keep all of your Favorites and Bookmarks online so you always have them on any computer or any location. Privacy settings on each link let you set them "Public", "Private", or "Friends Only". My photo blog of random pictures I take from day to day.